sugar free cocoa and beignets…. I made these little ‘sugar free’ goodies for an ami swap I was in. 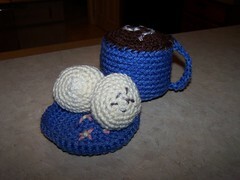 I got the mug pattern off crochet central but added a few extra rows. I made up the saucer and beignets…nothing fancy but I thought they were cute! Cute stuff. I hadn’t ever thought to make a teabag bookthong. Cool idea!